The same night that I made the quiche, I tried my second go at granola, this time using Julie’s Mixed Fruit and Nut Granola recipe as my base. I found it on Tastespotting just a few days before it disappeared. There were several things that attracted me to this recipe, the first thing being the picture of the overflowing pioneer enamelware bowl (they have a real name, I just don’t remember what it is) of granola at the top of the entry. My mother has some of that same dinnerware, except hers are red and not blue, and I love that dinnerware. For some reason, the sound of those plates and bowls clanging together while I was washing dishes was always comforting. And you can’t damage the dang things, either, not like stoneware or ceramic. Another thing was the abundance of dried fruits and nuts (imagine that, in fruit and nut granola). Personally, I like a little crunch and a little softness alternating in my granola. I like more than toasted oats. If I just wanted toasted oats, I’d eat Cheerios. I like some variety in my hippie cereal. And looking through the whole recipe, it looked fairly forgiving, something that I learned to appreciate in Part One. I did change some things, of course. I used honey instead of map le syrup because I don’t like maple unless it’s on my breakfast pancakes or waffles. Or my sausage. I have some local Georgia wildflower honey that I stand by (while I’m in the state, anyway) and it’s very tasty. I didn’t use quite the abundance of nuts that Julie did, because I don’t have that particular abundance of nuts in my house. I had pecans and salted sunflower seeds in the freezer, so I used those. I still used a lot of fruits, because I like them (as aforementioned), but I used golden raisins, craisins, blueberries and cherries. The cherries and the blueberries I was a little iffy about, because I don’t really like blueberries or cherries, but they were in the bag of mixed dried fruit and I figured it wouldn’t hurt me any. 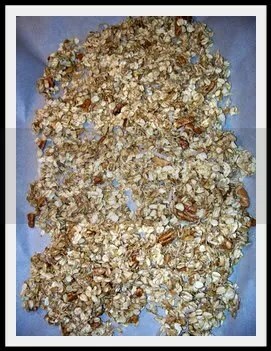 I only made half the recipe, because I don’t really need 12 cups of granola – I don’t eat it that fast. It took me a while to halve the oats, particularly, because I’m special and can’t do fractions anymore without the help of a calculator. I was a little worried about halving it because of the ‘sauce’ – in my experience, sometimes sauces don’t always agree that half the listed recipe is really half, more like a third. So when I was mixing all the dry ingredients together, I was going on faith that the sauce would be enough. 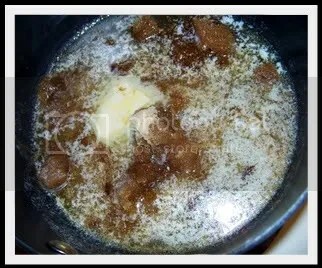 Faith was helped by the delicious scent of brown sugar and butter making good friends over heat. All that lovely combination of brown sugar, butter, vanilla, a touch of almond and a little cinnamon and nutmeg was mouthwatering. My spirits soared. Anything that smelled so good couldn’t be a horrible thing, right? There was more honey than canola, so I was sure that I wasn’t going to be bowled over by greasy, burnt oats and nuts by the end. I kept my faith in Julie. When I poured it in and started mixing, my faith began to waver, but I kept mixing dutifully. 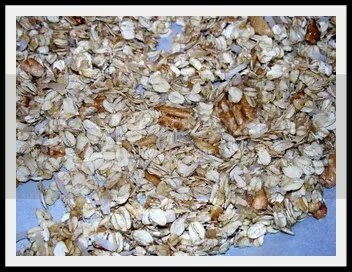 Eventually I felt that I’d done enough mixing and the oats looked coated, so I dumped it all out onto my parchmented sheet. I got a little more confident there, because everything was sticking together nicely instead of just falling out in a flood of oats and pecan pieces. I put it the sheet in the oven and shut the door, building up my faith and mixing up quiche. Every once in a while in my 50 minutes of baking, I checked on the granola, stirred it around, rotated the pan for even baking. It was looking good, so I ignored my negative side and let it go on about its business. When the timer went off, I let the granola go a little longer, taking my time with the quiche. When I finally took it out, it was browned and golden and smelled comforting. 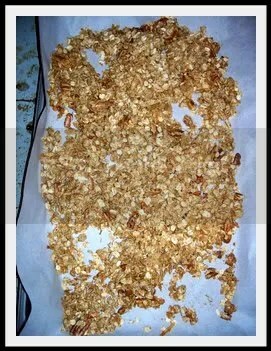 I drained and squeezed my reconstituted dried fruits, stirred them in the still-hot granola and pressed it all down to let it cool. While it cooled, I went on about my quiche. I took some of both my creations to work with me the next day. I was pleasantly surprised with the granola. It was nutty and sweet and salty all at the same time, but each flavor was defined. I’d chew on it a minute and get sweet from the honey and the fruits, and then I’d get a burst of salty from the kosher salt and the sunflower seeds, and overlaying it all was that roasted oat and nut flavor. Nothing overwhelmed anything, but melded together beautifully. The golden raisins and the cranberries were old familiar friends, but I was actually kind of happy with the cherries, too. (I either haven’t caught a blueberry or haven’t been able to taste one.) They were tart and sweet and chewy. I wasn’t expecting to like them. This mix didn’t even take away from the flavor of the yogurt (I prefer vanilla), but complemented it! Overall, if you can’t tell, I love this version of granola. Julie, my faith was not misplaced – thank you! It even goes well with nonfat vanilla yogurt. In fact, it makes it bearable better! (Ever buy something by mistake in a rush at the grocery? I bought nonfat yogurt.) This is definitely a breakfast, or snack, or anytime staple in my pantry from now on. I’m never going to buy storebought ever again, because I don’t have to! (Now, if I can just find some enamelware of my own for cheap… it’s such a shame that economics works and demand makes prices rise.) I’m going to recommend this recipe to anyone that wants to ask me, because I love it and it deserves recognition. Now that Part Two was a success, one would think that I would stop. “Your granola search is over,” one would say reasonably. But no! I’m not to be swayed. I may have found a recipe I adore, but who’s to say I won’t find more? Granola, then the world! 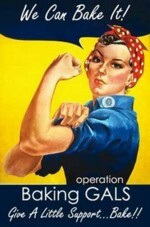 Onward, I say!